Project Stratos is the flagship project of DARE (Delft Aerospace Rocket Engineering). The project sets out to realize our ultimate dream: launching a rocket to space. Reaching Space is the ultimate ambition of a student rocketry team. It’s the equivalent to running 100 meters in 10 seconds, or a marathon in 2 hours. With reaching Space we will reclaim the European and Worldwide Amateur Rocketry Altitude Record for DARE and put us in the history books as the first student team to reach space. In order to realize this dream, we rely on the knowledge gathered during three previous Stratos project. Stratos I, a two-stage solid rocket, launched in 2009 to an altitude of 12.5 km, setting the European Altitude Record. Stratos II+, a hybrid rocket, launched in October 2015, breaking our own altitude record at 21.5km. Stratos III was launched in the summer of 2018 aiming to reclaim the altitude record that had since been taken from us. Despite the launch was not successful, an anomaly occurred 20 seconds after the launch, resulting in the loss of the vehicle, we have learned a lot. “Design, build, test and launch a rocket to space before the end of August 2019 while carrying a scientific payload onboard”. In order to realize this ambitious goal, the Stratos IV team will build upon the existing Stratos III design. Towards the end of the Stratos III project it became apparent that the Stratos III rocket had the potential to reach space. Recognizing this potential, a number of design choices and innovative new solutions will be implemented and we will be ready to launch again by August 2019. The design was revealed at the beginning of February 2019. Stratos IV is designed and built by a team of 16 full-time and 60 part-time engineering students from Delft University of Technology. Stratos IV could never have been built without the support of all her partners from industry and academia. Stratos IV will launch from the Denel Overberg Test Range located, near Arniston, Western Cape, on the southern coast of South Africa. Drogue Parachute designed by our recovery team, ejected after nosecone separation and pulls out the main recovery parachute. Engine Bay, controlling the engine. 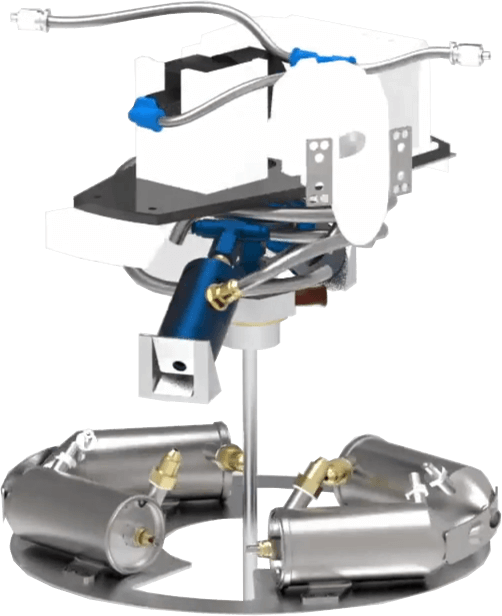 It allows for the flow of 6kg/s of nitrous oxide from the oxidiser tank to the combustion chamber by means of the feed system in its centre. The engine control unit controls all the valves and motors in the engine bay. 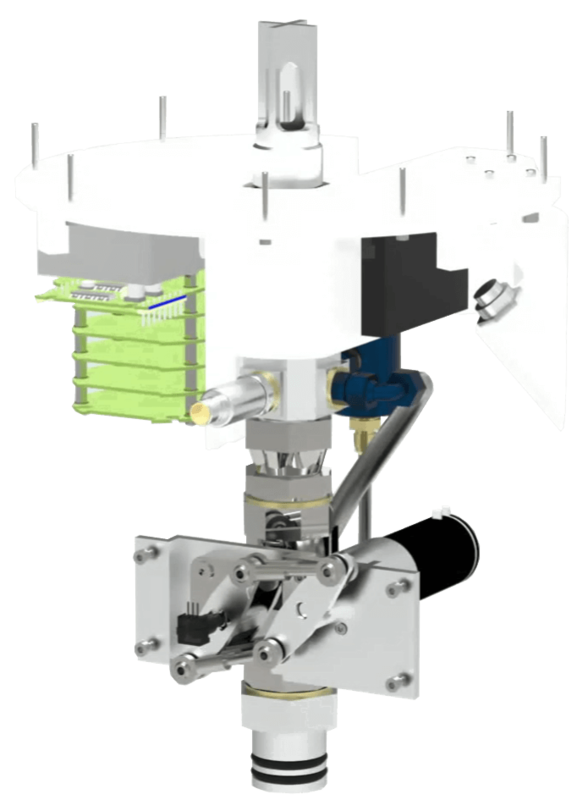 The flight termination system allows for a safe launch, since it will automatically terminate the flight when the vehicle flies out of a predetermined safe-to-fly zone. 3D printed Titanium Nozzle, saves 10kg on the full graphite design that was used before. Two smaller pieces of graphite are used in the hottest parts of the gas flow, which can reach 3000K, while a titanium shell coated with zirconium-oxide is used at the cooler parts of the combustion gases. Roll Control, making sure that the rocket is stable during flight. 4 nitrous oxide monopropellant thrusters, producing 40N each, keep the roll rate of the rocket within reasonable bounds. Oxidiser Tank, holds 174kg of nitrous oxide, stored at 60 bar. It uses an 1.5mm thick aluminium liner overwrapped with carbon fibre to increase the strength. The oxidiser tank makes up most of the rocket, standing over 4.7m tall. Stratos IV is launched from South-Africa. After ignition, the vehicle starts its journey to space, powered by the DHX-400 'Nimbus' hybrid rocket motor. 38 seconds in the flight, the vehicle runs out of propellant and the engine is shut down. However, the vehicle still has an unprecedented velocity and has already passed the most dense layers of the atmosphere, giving it enough kinetic energy to reach the Karman line. 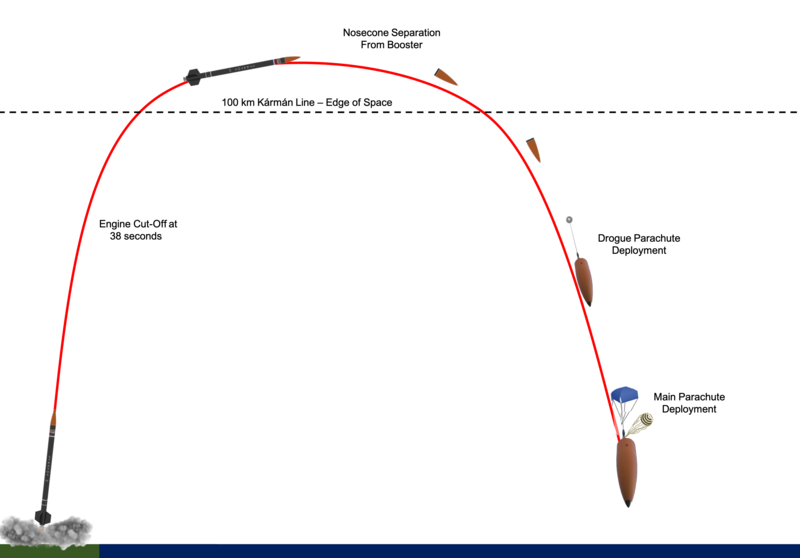 After the rocket has reached its apogee, the nosecone with recovery pay separates from the booster and starts a re-entry, followed by a series of two parachute deployments to slow down the nosecone for sea recovery. The booster is not recovered. The first Stratos rocket was launched from Kiruna, Sweden in 2009. This two-stage, solid propellant rocket reached an altitude of 12.3km, which at the time set the European altitude record for student rocketry. Stratos II, the successor of Stratos I, was meant to fly even higher than that, but unfortunately did not lift off due to a misfire of the engine. This lead to a redesign of the rocket, namely Stratos II+. Launched in October 2015 from an INTA facility in Huelva, Spain, Stratos II+ flew to an altitude of 21.5km, breaking our own record set by Stratos I. Recently the record was broken by the Hybrid Engine Development from Stuttgart, Germany, setting it to 32.3km. Consequently, DARE decided to combine the knowledge that was gained during the Stratos I and Stratos II projects to develop Stratos III, which was being designed to go well beyond that boundary and improve the European student altitude record. The rocket was launched on the 26th of July 2018 from INTA in Spain. 20 seconds into the flight it encountered an anomaly and the vehicle disintegrated. The Stratos III team worked incredibly hard over the past two years and while we were disappointed by the failure, the Stratos IV team recognizes the potential of the Stratos III design. 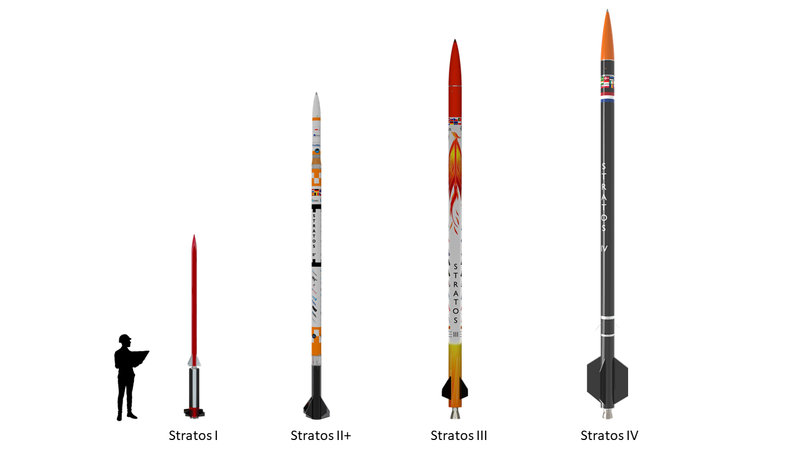 The Stratos IV rocket will, therefore, be heavily based on Stratos III. Read more about previous Stratos missions. Project Stratos is carried out under the flag of Delft Aerospace Rocket Engineering, however it falls under the legal responsibility of Stichting Students to Space, KVK: 53164008, VAT: NL850775218B01.